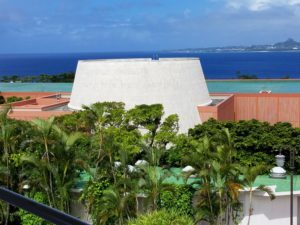 Okinawa, Japan, the main island of the Ryukyu chain, serves as a tropical paradise for many Far East nations. Think of it as a superb vacation resort. Bring sunscreen and light clothing for your day at the Ocean Expo Park. The lush tropical vegetation, colorful flowers, and large park areas entice you to enjoy the beauty and culture of the island and its people. Crowds of young Oriental school children hustle along the wide, concrete paths leading to the six different sections of the Park. While the park accommodates handicapped visitors, including free trams for long distances, hiking enthusiasts will enjoy miles of stimulating garden and architectural wonders along with the Park’s main attractions. If sight-seeing in August, be thankful for the constant breeze that makes the sultry air a pleasant warmth. 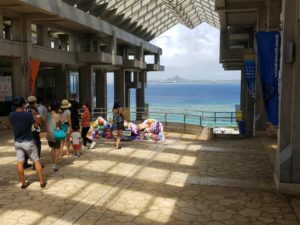 Racing down four sets of stairs, we enter a large information center displaying the destinations in the park: The Tropical Dream Center, Oceanic Culture Museum, Native Okinawan Village, the Okinawa Churaumi Aquarium, Emerald Beach, and the Okichan (Dolphin) Theater. entrance. Parents and children alike stretch hands into clear salt water “touch and see” displays to brush bushy anemones and rough starfish surfaces. Hallways that could accommodate several cars side-by-side lead you into darkened corridors that shrink in size to provide better views of the brilliant yellows, reds, golds, and electric blues of tropical fish, eels, crabs, lobsters, sharks, mantas, and other inhabitants of the Okinawan waters. 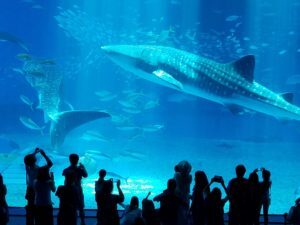 What’s a “must-see?” Four whale sharks, about thirty feet in length, swimming in a vast aquatic tank surrounded by beautiful coral, sting-rays, manta’s and native Okinawan ocean-life. The massive tank is a third the length of a football field, more than half the width, and taller than a goalpost in the end zone, which dwarfs the hundreds of spectators by the plexiglass viewing area. The entire tour submerges the explorer on a virtual dive from coral sea life to deep sea life. Several educational movies are shown throughout the day. Find the time to catch one. Bursting through exit doors, we surface to bright sunlight. 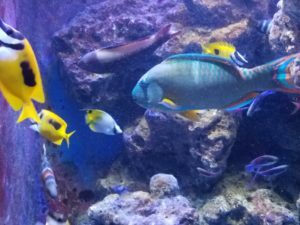 The next adventure lies below the Aquarium. Sea turtles swim lazily in their pool and manatees glide through the water, playfully dodging each other. A short walk brings you to the Emerald Beach, named for the turquoise blue of the coral reef water. Children can build sand castles, race on the shoreline, or roll up their pants and wade in the crystal clear water. After a short visit, the family would want to capture the terrific Dolphin Theater events. The shows are dazzling demonstrations of dolphins and humans cooperating to achieve superb results. Did I hear someone ask about the splash zone? Be ready.